Roots of Change funded the development of a comprehensive system dynamics mapping project that brought together 35 stakeholders representing a very wide range of interests. We facilitated stakeholder conversations to help them reach a shared understanding of how a sustainable food and agriculture system would work and what actions are required now to ensure such a system emerges by 2030. The time frame for this project was September 2010. System dynamics mapping is a tool for building shared understanding of a complex reality. 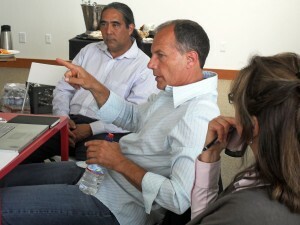 At Roots of Change, we use it to address the complexity of both the management and transformation of the food system. We used system dynamics mapping to bring together 35 stakeholders representing a very wide range of interests and help them reach a shared understanding of how a sustainable food and agriculture system would work and what actions are required now to ensure such a system emerges by 2030. Click to download a PDF of the complete map. Interview each of the stakeholders to clearly understand their perspectives in the overall food and agricultural system. Document that understanding in the form of a rigorous, systems-based representation of each of their perspectives creating a series of individual “systems maps,” and verify each map with the participant. Integrate those individual perspectives into a single integrated “systems map” which we use to create a shared understanding of the system as a whole. Validation with five key participants by phone and incorporation of feedback into the main map. Two group sessions to identify leverage points—conducted by webinar/phone conference. In-person strategy session to identify strategies for using the leverage points. This collaboration resulted in a map illustrating the dynamics of the different parts of the food and agriculture system, and produced convergence in thinking regarding the leverage points that will produce the most progress toward sustainability. The mapping process was led by R Scott Spann, MPA, and Founder of Innate Strategies. He has used similar processes to help RE-AMP find common ground on issues of plant pollution in the mid-west, and to unite stakeholders in Guatemala. His work seeks to satisfy diverse stakeholders—NGOs, government, and business leaders wishing to do the right thing in a competitive environment—in ways that benefit the whole. Scott’s experiences range from consulting with Arthur Andersen & Co. to launching the Texas office of the Nature Conservancy; serving as Managing Vice President of RPC, a small national consulting firm, to leading the Rolf Institute as Executive Director; Vice President for ARC, International, a global consulting firm specializing in leadership development and cultural change, to working for Stone Yamashita Partners, a leading branding and strategy firm. For more information on user rights of our strategic maps please email info@rootsofchange.org. Error: Error validating access token: Session has expired on Tuesday, 26-Mar-19 12:54:16 PDT. The current time is Sunday, 21-Apr-19 07:58:22 PDT.